Our second child was due September 16th, 2012. We were having another boy and were excited that we could afford a home birth with midwives for this pregnancy and birth. Our first birth was in a hospital and it ended in a cesarean section after almost three hours of pushing with a “sunny side up” baby. We interviewed several midwives and ended up choosing the same midwives used by a few people we knew. Both midwives were Certified Professional Midwives (CPMs); one with over 10 years of experience, the other with over 20 years of experience. They each train other midwives as well. I also had complimentary care (back-up care) with a group of hospital-based midwives. They were recommended to me by my CPMs. I saw the hospital midwives for blood work, ultrasound / anatomy scan and GBS testing. The pregnancy coincided with the best summer of my life. Stava (my husband) and Dasaratha (our toddler) were able to accompany me to most of the prenatal appointments which was really special. I was healthy and felt great. Just like my first pregnancy, I did not have gestational diabetes (nor did I during my third pregnancy). We went into labor on a Friday night but it stopped as soon as one of the midwives arrived. She left and told me to try to get as much rest as possible before things picked up again. I had light contractions until Saturday evening when things became intense. Both of my midwives came over that night. We had my grandmother take Dasaratha to his aunt and uncle’s home while I was in labor. I labored leaning on Stava and moaning with him. At a certain point I was saying, "These contractions are stronger than me, I'm not handling them well," and I decided to get into the tub. What amazing relief! No back labor this time, baby was in perfect position and very low. The midwives checked his heart rate regularly and the whole time he was happy as a clam. We put on the birth CD my friend made for us while I labored. Eventually I felt the urge to push and started to do that. I was a little worried that I would push before fully dilated so I hopped out of the tub and had my midwives gives me an internal exam (the only internal exam I had from them during my labor… during my entire pregnancy, actually). I was 10 cm so I got back in the tub and when the urge hit, I pushed with all of my might! I pushed for two hours but it didn’t seem very long at all, not like Dasa's. I pushed not on every contraction but when I got a "good pushing one" I would say, “This is it!” and grip the side of the tub stand up on my knees and holler and push. I reached down and felt baby's soft head, it was awesome. I had Stava feel, too. The midwives were checking his heart rate with the Doppler pretty frequently now and it was right where it was supposed to be. They also checked my blood pressure throughout labor. Sometime during the pushing I felt the water bag burst and the midwives rushed over to the birth tub with flashlights to check the fluid; it was clear. At some point I felt like my pushing was becoming a little less effective and the midwives suggested I hop onto the birth stool. That really directed the pushing energy. Only two or three pushes on that and I had his entire head out! I was done at that point. I was exhausted. I said, "Do I need to push anymore?" My midwife said, “Yes. You need to push with everything you have." Then she said, "You need to get on hands and knees." Panic hit me. I had read enough birth stories to know that meant shoulder dystocia. I got onto hands and knees and pushed hard, thinking they would be able to hook him and pull him out. They told Stava to call 911 and then had me get standing upright to push. Then I was lunging, standing, hands and knees, on my back with legs pulled all the way back and suprapubic pressure applied. We tried all these positions rapidly again and AGAIN. I kept screaming, "I can't push anymore," because I was exhausted or "I'm still pushing!!!" because I was still pushing and felt no give from the baby. I screamed a lot and there was blood everywhere, all over me, saturating the floor. The two midwives kept taking turns trying to hook my son or break his arm and hook it, and they were putting oxygen alternately on me and then the baby. Stava told me later, "They had to tear you apart to get to the baby." We just kept going in those positions. It was excruciatingly painful, I screamed and screamed and pushed and pushed. Finally he came out, with me in the hands and knees position, at 1:42am on Sunday…. twenty minutes after his head had been born. He looked so small, and even though he was all pink and peach, without a tinge of blue on him I could tell he was lifeless. He was so limp and floppy. He wasn't breathing and had no pulse. The EMTs began CPR and intubation immediately. I was sure that he was dead. My own heart rate was at 200 and the EMTs were instructing me to focus, take deep breaths and calm down. The midwives gave me two shots of Pitocin in the thigh and some Chinese herbs to stop bleeding. We stayed in the room for 15 minutes and then we each got loaded onto an ambulance. As I rolled past my son’s ambulance they told me he had a pulse. I couldn’t believe it, I was so relieved. From there we went to the ER, Stava was sobbing on our son’s side of the room and my heart was stricken fearing for the worst. They did all kinds of things for him, that I’ll never know the whole of, and they managed to get an IV in his belly button. They gave me three IV ports and pumped me full of blood, Pitocin, morphine and two kinds of saline water. I had 3rd or 4th degree tears (I heard both from different doctors in the next couple days) and retained placenta, which needed to be manually removed. A few hours later we both transferred to a bigger hospital with a level 3 NICU, and they cooled our son’s body for 3 days to try to keep brain damage as low as possible, but his brain was just completely gone. 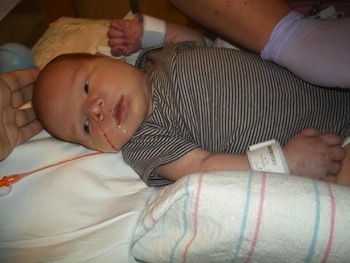 He was 23.5 inches, 10 pounds 15.4 ounces when they weighed him. I finally got to hold him when he was 3 days old. Our son, Shridam. He never cried and could only move his arms and face a little. They told us his EEG and MRI showed no brain activity and that he would not live for long. That Friday, Shridam managed to knock his arm into his ventilator tube, unpositioning it. We decided not put it back in and he breathed on his own until early Sunday morning when he gently died in my arms, one week old. 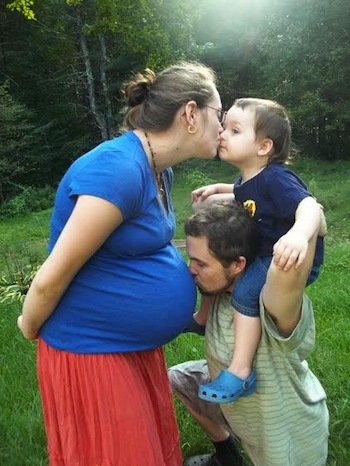 Unlike many other homebirth loss moms I have met since Shridam’s birth and death, my midwives weren’t negligent. They didn’t lie to me. They called 911 right when they needed to, the moment the first red flag came up. They monitored me the entire time. They were experienced, certified midwives. Those things were simply not enough. Their skill wasn’t enough, their equipment wasn’t enough, the sheer fact that there was two of them versus a whole labor and delivery staff wasn’t enough. Our “transfer plan” was just too little, too late when emergency struck.